I don’t think I’ve ever made peanut butter cookies before. How said is that? Sure, I’ve made cookies and various other treats with peanut butter in them but I’ve never made a straight-up peanut butter cookie. That’s right, I’ve never had the pleasure of smooshing fork marks into the top of thick, rich, peanutty dough balls. Truthfully, I’ve always been a little put off my recipes calling for peanut butter and butter in PB cookies. Why do they need both? It’s only fair to give this standard recipe a try before declaring it ridiculous. it just so happens that my grandmother’s recipe file (let’s just call it The File) contains such a peanut butter cookie recipe. It’s on a leaf of notepaper that fell out of The File’s torn bottom back at my dad’s house. 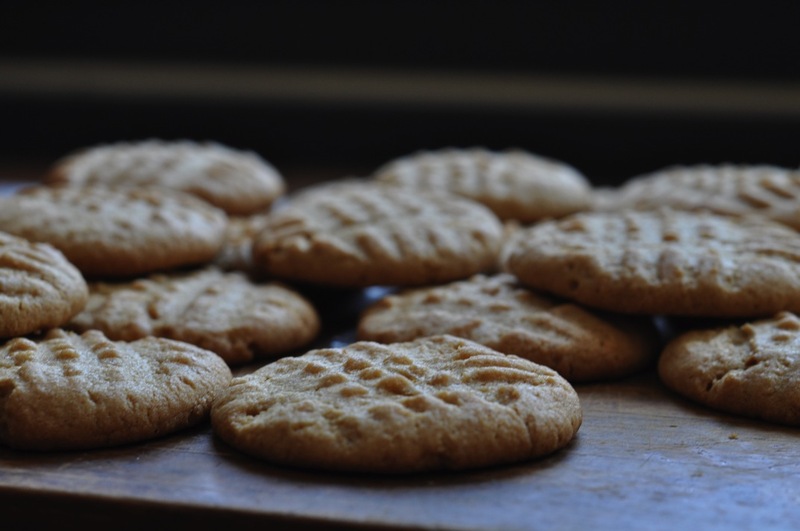 Peanut butter cookies are at the top of the page and below is a recipe for Icebox Cookies, followed by Coconut Haystacks on the back. 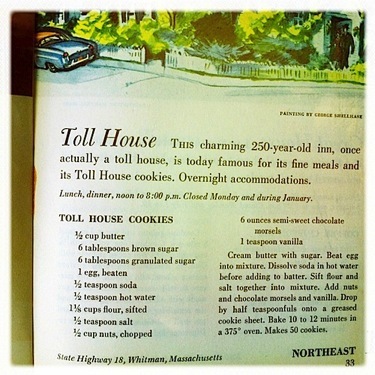 There are little notes in the margins next to each recipe, one noting that the PB cookies are a nice, small recipe. 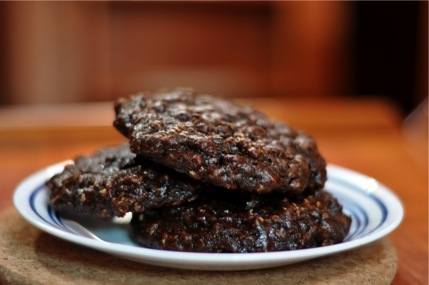 The icebox cookies are also described as a small recipe and a note says “better double it”. I love these little voices from past kitchens. I don’t know whose they are, since the handwriting doesn’t really look like my grandmother’s. I’m guessing that my great-grandmother (G.B.) wrote these lines. She was the queen in the sweets department. I can picture her planning a day of cookie baking for some special occasion. 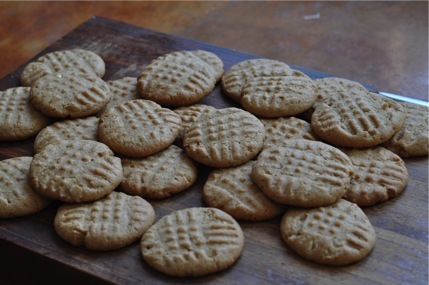 Here they are, plain-old peanut butter cookies. They’re far from a secret family recipe but as my first peanut butter cookies, I’m quite proud of them. I’m also proud of myself for hustling them out of the house as soon as I baked them. I took these cookies (along with some lovely chocolate chip cherry cookies I made yesterday) to Lee’s work this morning. Giving away baked goods is always more satisfying than eating all of them yourself. I assure you, though, I tested these cookies and they are good! Combine the flour and baking soda in a medium bowl. In the bowl of a stand mixer (or by hand if you’re buff like me), cream together the butter and sugar. Add the peanut butter and blend thoroughly. Add the flour mixture, one cup at a time, to the wet ingredients. Mix until you have a smooth dough. Cover dough with plastic wrap and refrigerate for as long as you can wait to make your cookies (not part of the original recipe). Preheat oven to 375 degrees F (a “medium oven”, as the recipe says). Spoon dough onto parchment, Silpat, or oil-coated cookie sheets (I ended up with 22 cookies). Smoosh the tops of the balls with the bottom of a fork in perpendicular directions. Bake for 12 minutes or until cookies smell yummy and you can’t wait to eat one! 2011, here I come! I’m back from my Christmas hiatus and blogging is a top priority for this year. 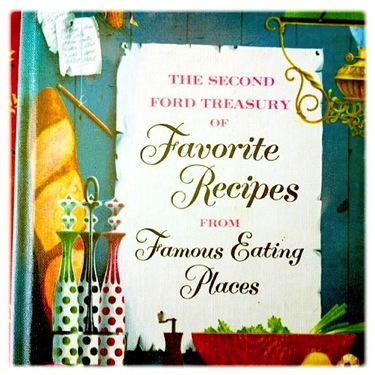 There are so many recipes I can’t wait to share and so many dishes I want to try! The highlight, I think, will be taking my culinary and other adventures to the Caribbean. Warm water, tropical fruit, and new cultures are on the horizon and I’m anxious to experience everything! Double chocolate fig from Fran’s Chocolates in Seattle. On to the food. It’s not like I wasn’t cooking over the holidays. I took advantage of my mom’s kitchen in all it’s spacious glory. We baked Christmas cookies (decorated cut-outs like we always do), put together quite a spread for Christmas dinner, and enjoyed several family favorites. Eating Light and Crisp Waffles, one of my mom’s standard breakfast treats, for dinner on Christmas eve was perfect. I am very sentimental about those crispy, tangy waffles and they made a satisfying dinner on a winter evening. Our meals out were as memorable as the one’s we prepared at home. My mom’s new neighborhood boasts fabulous restaurants like the vegetarian delight, Cafe Flora. We even had a little dinner party with a few Seattle friends, an occasion when it helps to have two cooks in the kitchen! I was sad to leave Seattle on New Year’s eve, but Lee and I had to get back to the boat in Charleston and keep moving south. I managed to pull together black-eyed peas and slang jang on New Year’s day. My grandmother would be so proud. Yesterday I was back to my old baking tricks and I’m proud of my first treat for 2011! These cookies are appropriate for resolution season, although that was not my intention when I came up with them. Brainstorming recipes while I run frequently produces interesting results. This time it was super-sized cookies with bonus protein! I wanted to use up the last of some Trader Joe’s chocolate hemp protein powder. I put the last few scoops in these cookies and now I wish I had more! I think I like it much better with peanut flour and oats in a cookie than I do in a smoothie! These big, cake-like cookies are chocolate peanut butter heaven. 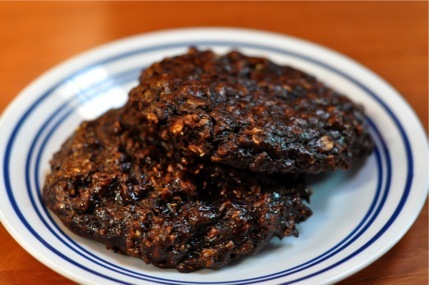 I’ve been munching them happily with the knowledge that I’m fueling up with protein, fiber, and healthful fats. Combine flour, oats, protein powder, baking soda, and salt in a large bowl. 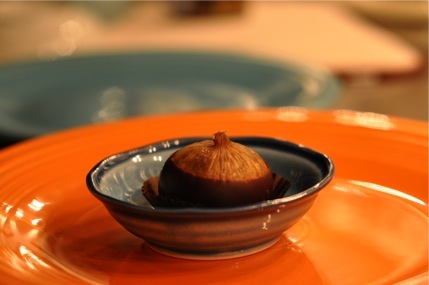 In a separate bowl, beat together egg, sugar, prune puree, and yogurt. Stir in vanilla. Add wet mixture to dry ingredients, stirring till fully combined. 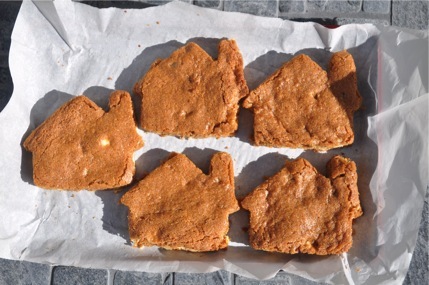 Spoon onto prepared baking sheet (lined with parchment, silicone mat, or cooking spray), leaving 2 inches between each cookie. I made mine quite large and ended up with 7 cookies. Bake at 350 for 15-18 minutes. Try one while it’s warm and gooey! I needed a treat yesterday. I needed something quick and sweet that also packed a powerful punch of nutrition. Bob’s Red Mill came to the rescue. I am completely in love with many of their products and frequently find excellent recipes on their bags. Bob’s Red Mill has never contacted me or anything and has nothing to do with this post. 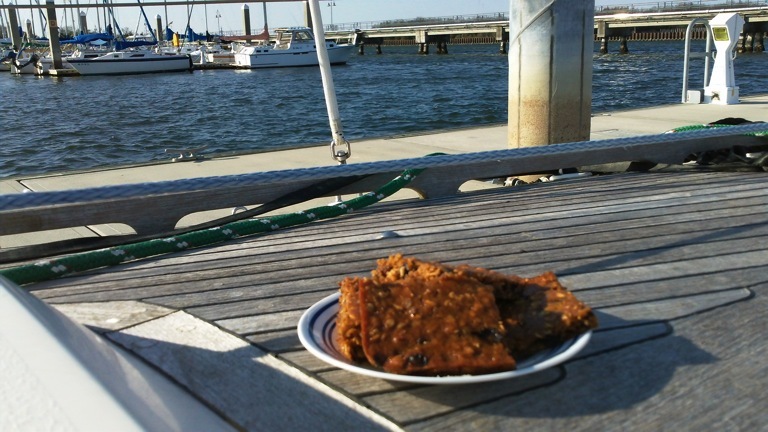 When I first bought supplies for the boat I accidentally ordered two cases of Bob’s Old Country Style Muesli. I meant to order one but must have added it to my Amazon list twice or something. Each case has 4 18oz bags. That’s a lot of cereal! It’s a good thing I like it! Really, using up all this muesli is no problem. My favorite cold breakfast mix is muesli soaked in plain yogurt and a little milk overnight, with banana and maybe some flaxseed meal and pumpkin added in the morning. Then of course there’s the cookies. The recipe on the back of this particular Bob’s Red Mill package is for Chocolate Chip Muesli Cookies. I made them once as soon as I discovered this and they were quite tasty. Without added butter or oil, they are definitely healthy treats. Of course, I moved on to other cookie recipes. I have kind of a short attention span when it comes to these things. A few weeks ago I snagged a bag of peanut flour at Trader Joe’s. I had read about peanut flour in various places and was anxious to give it a try. For some reason, my brain went back to the Chocolate Chip Muesli Cookies and presented them as ideal candidates for a peanut flour experiment. The recipe calls for very little flour so replacing all of it with peanut flour seemed like an excellent idea. I hoped to end up with a peanut buttery cookie with all kinds of muesli goodness. That’s almost exactly what I got and yesterday’s treat craving was totally satisfied. I say almost because I didn’t bake the cookies as cookies. 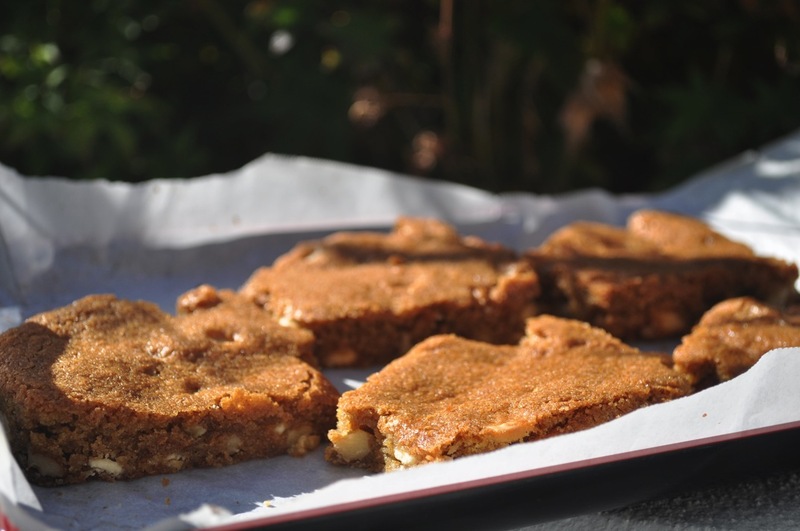 For purely practical reasons, I spread the dough on my quarter baking sheet and made bars. That way I didn’t have to scoop and bake 3 or 4 mini-batches of cookies while the oven heated the boat to 90 million degrees. 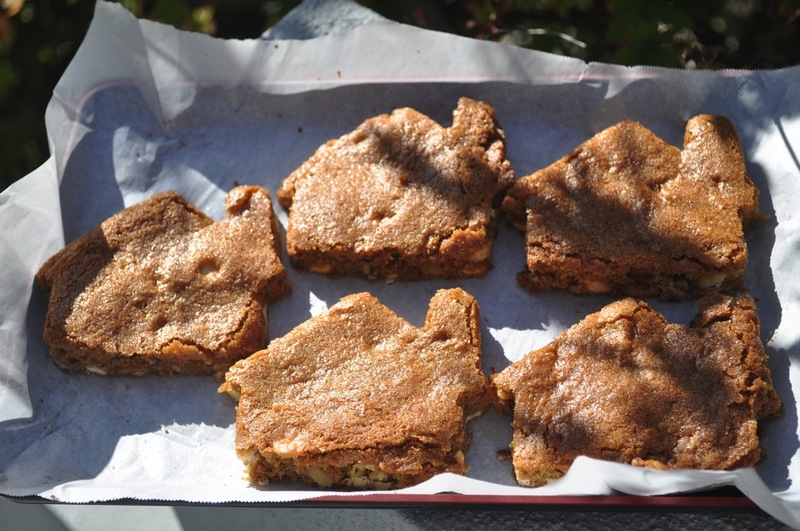 A silly measuring mistake also contributed to the less-than perfect cookie bars. I misread the recipe and added 3/4 cup of applesauce instead of 2/3. It was kind of a heaping 3/4 cup too, since I didn’t want to leave a spoonful of applesauce in the jar! 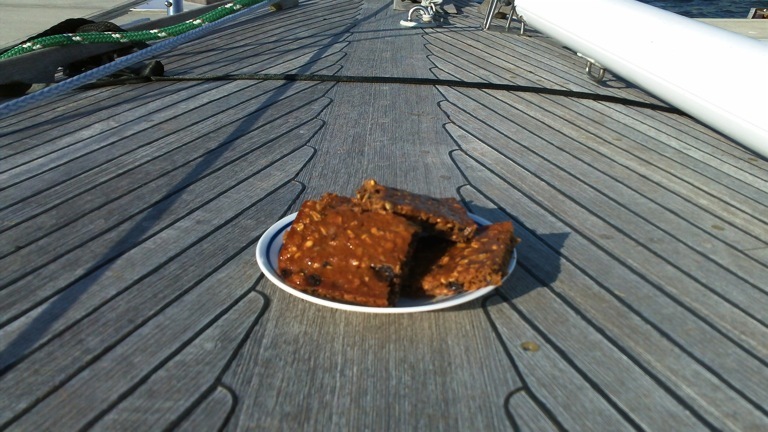 The added liquid made a batter rather than a dough and turned out rather moist bars. They’re still totally edible and delicious. They just kind of fall apart in your hands. The peanut flour was perfect. Alongside the texture of the muesli, the peanut flour produces a rich cookie with plenty to chew on. I think these would be great as big breakfast cookies. I cut my sheet into12 bars but next time I think I’ll make 12 big cookies. In a separate bowl, blend applesauce, sugar, and vanilla. Beat in egg. Add flour mixture to bowl. Stir in muesli and chocolate chips. Drop by tablespoonfuls (or more for larger cookies) onto a lightly greased cookie sheet.